-The debts which every individual carries and has to exhaust are of five kinds: 1) Debt to mother 2) debt to father, 3) debt to Guru, 4) debt to ancestors and 5) debt to self. -The family tree must be seen and the ancestors should be remembered daily. -Mahalaya Amavasya. 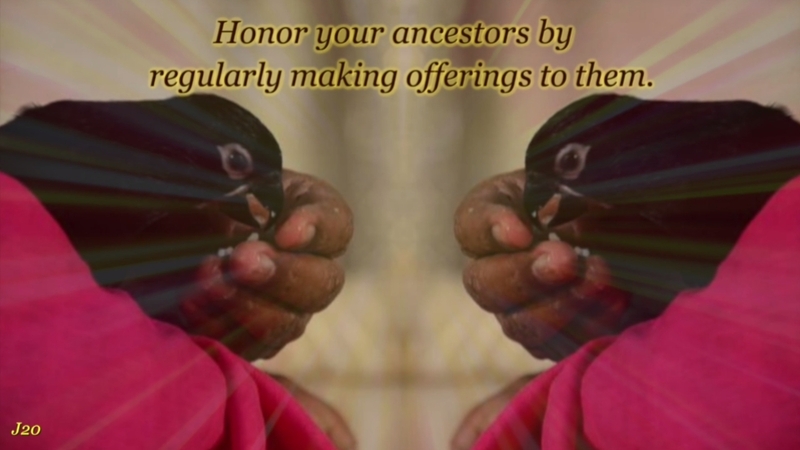 It is a day that is special for the ancestral spirits. During Dattatreya Jayanthi Celebrations, Pujya Sri Swamiji worships the cooked rice heap. (Punya Smarana – A Prayer for the departed souls, who have rendered service to Datta Peetham). During this ceremony a Black Bird can be seen besides Appaji.